This issue of the WORKS is going to get a bit “preachy,” so forgive us in advance. We are making a pitch for education and we mean it in the broadest sense of the word. It is going to range anywhere from kindergarten to seminars on sub-atomic particles. S. I. Inc. has always been in the business of educating its clients. This took the form of classroom instruction when we were marketing MCS-3. When developing a capability for a client, like the CRM system for a systems integrator, we always build into our contract time to teach the users of the product how to get the most from our work. Early in his career Robert Schuldenfrei spent almost five years teaching computers to business majors at the University of Rhode Island. When we are not doing the work, or teaching others, we are educating ourselves. This means taking courses or just plain reading books and trying things out. Some of our best products and services came from learning about something, testing the ideas, and developing a capability to offer this to our clients. We are not afraid of taking a three inch book off the shelf, opening it to page one, and reading it complete to the end. In fact, there is money to be made in learning how to do something that way, and selling the instruction to a client. There is a cute story told about the late Supreme Court justice Felix Frankfurter, although I do not know if it is true. The old man was lying on his death bed reading a book when a visitor came into the room. The man said: “Felix, what are you reading?” To which the Justice replied: “This is a Greek Grammar and I am teaching myself Greek.” The man, taken aback asked: “Why are you doing that?” “Because I do not yet know Greek” shot back Frankfurter! High Tide Software Taps S. I. Inc.
Late in June, High Tide Software (HTS) of Newton, MA asked S. I. Inc. to help in channeling their business into more profitable areas. HTS is a leading developer of board level software. They have recently received worldwide recognition for having their code included in the new release of the Microsoft server operating system, Windows Server 2003. Most all of their work, over their six year life, has been in the area of high speed signal processing. They have an excellent reputation in fields as wide spread as telephony and medical image processing. Frank Perron, president of HTS, wanted to expand his reach into some very exciting areas. Chief among these is the new field of web services. This endeavor takes new or existing business applications and makes them available over the Internet using the World Wide Web. A user, with the proper authentication, could interact with his local software from anywhere in the world. Since S. I. Inc. has strong business applications experience, it was a natural choice for HTS. Focus groups have gotten a “bum rap” in the popular press. When ever a politician wants to slam his opponent he claims that the other guy is just listening to what his handlers have learned from focus groups. The implication of this is the opponent has no principles and is just telling the electorate what it wants to hear. In business as in politics this might not be such a bad idea. Let’s investigate focus group research and try to briefly understand this tool. When should you consider using focus group research? 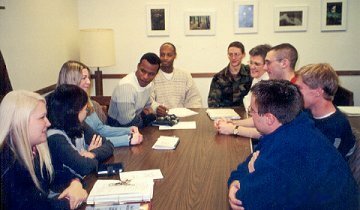 Like surveys, market experiments, and test markets, focus group research is just one of the many techniques that fall under the larger category of “Marketing Research.” First and foremost, a focus group is a “proof of concept” technique. It is by definition qualitative research. There are few, if any, statistics emanating from this effort. It is most usefully employed in the middle of product (or service) development. The product must be fairly well along such that the group can get a good idea of what it looks like, what it does, and how he might use it. The group will be the first real “users” to look at this new entity. What you want to gain from focus group research is their reaction to the new offering. In the paragraphs that follow we are going to outline the steps of a typical client engagement involving focus group research. As an example we have drawn on an actual project we did for a major computer manufacturer. The first thing that we need to establish is the “research objective.” That is, what question is the research going to answer. The client was thinking of packaging up some professional services to be sold and delivered by partners who are Value Added Resellers (VARs). The client wanted to know how this would be received by the VARs. We proposed using focus groups, made up of VARs, to address this question. Our research objective was to find out if the VARs would enthusiastically resell and deliver the services packaged by our client. By the end of our engagement we needed to have a yes or no answer. Once we establish the objective we need to concern ourselves with the logistics of running the sessions. Often you need geographic dispersion. This was the case in our study as we ran four groups in three American cities and one Canadian location. It is very important that the group be composed of people who look like the market in general. Because focus groups are between 10 and 20 people you must recruit the attendees with skill. We had representation from big VARs and small. We had people with both wide and narrow product focus. We had attendees who sold our client’s products exclusively and those who handled additional competitive lines. It was deemed important to feed the attendees, pay them for their time, and record each session on video. Although it is not mandatory, we believe that every focus group should have a “model product.” In our case it was a model service. This is something concrete that you can put down on the table so that the attendees can get a real feel for what the finished offering will look like. Since we were testing a service, the moderator (the person running the focus group) took five minutes to describe our model service. Our client was proposing to offer an installation service for a very large computer storage product. The service was created by our client, but sold and performed by the VARs. Now you are all set with your guide book in hand to run the focus groups. When they are all complete you take the video tapes and transcribe each session. Everything that an attendee says is coded with a number. Because the sessions are on tape, most of the time you can coordinate the comment to a person and a company. This provides the major input to the final report. Some would not do anything in the final report save a general comment as to a sense of the sessions thus leaving it up to the client to draw his own conclusions. This is not the way we do it. First, we explain in general how we met the research objective. In our example study the VARs would resell and deliver the kind of services our client was developing. Second, we defended each and every conclusion with the coded comments transcribed directly from the tapes. Thus, we did not state our conclusions as assertions, but proved them one by one. Finally, we added new insight that came out of the focus group serendipitously. These were concepts that the client had not foreseen. In our work we found that the VARs would not only like to resell the packaged services of our client, but the packaged services of other VARs! This was news to our client as our client believed that the VARs looked at other VARs in the room as competitors. This was clearly not the case.